I’m a bit of a frozen-meal connoisseur. Back when I had to go into an office to work (gasp! ), microwaveable meals were my go-to lunch, especially when I was late getting around in the morning and had to grab whatever was easiest to pack (which was most days). I’ve done Smart Ones, Lean Cuisines, and of course, Healthy Choice—basically whatever is on sale. 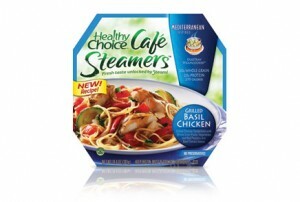 I was excited to try Healthy Choice’s Café Steamers in the hopes that I would get to add a couple of more faves to my rotation. I tried the Chicken Pad Thai, the Grilled Vegetables Mediterranean, and the Lemon Garlic Chicken and Shrimp. I have insanely high standards for pad thai, so that one didn’t blow me away, but I did like the other two options, especially the Lemon Garlic Chicken and Shrimp, as it’s not often I get to eat shrimp for lunch. All three options were a great way to sneak in some veggies, but at 270 calories or less per meal, I found it necessary to supplement my lunch with additional items so I wasn’t hungry an hour later. The steamers are a new twist on the heat-stir-heat option. The steamers keep the sauce and the entrée separate during cooking for extra freshness, and then you dump the meat/rice/noodles into the sauce. I do think the veggies tasted fresher, but it didn’t necessarily knock my socks off in comparison to non-steamed options. They did the trick of giving me a hot meal for lunch though, and that’s what matters to me! You should know two things about me before I start this review. No. 1, I ADORE taco salads and, No. 2, this movie changed my plate. With that said, I was instantly smitten with Beanitos from the minute they arrived on my doorstep. These 100 percent corn-free bean-based snack chips crunch just like a corn tortilla chip, but they have a low glycemic index rating and are gluten, wheat and soy free. They’re also high in fiber (5 grams an ounce! ), Omega 3s and contain a little protein. Oh and get this. They taste good, too! My hubby and I munched a few during a road trip, and they actually filled me up. They’re excellent with salsa and other dips, and they are perfect in a taco salad. (Again, my fave!) The chips come in a pinto and black bean variety, and while both are good, I preferred the pinto bean variety for its flavor and crunch. Now, they are a tad salty, so if you are sensitive to sodium it’s best to stick to a small portion of these. And if you’re not watching your sodium (shame on you…), then just beware eating a whole bag. Ten chips has about 150 calories, so that adds up—as does the 5 grams of fiber per serving. Don’t say we didn’t warn you. Thanks for the post, and we love them in a taco salad too! We are all on a hummus kick around the office also, and we have acutally just reduced the salt content in both flavors to 55mg per serving! (Down from 80mg on Black Bean & 190mg on Pinto Bean and Flax) The salt is on the chip itself, not in the batter, so you get the sea salt straight to the palate. 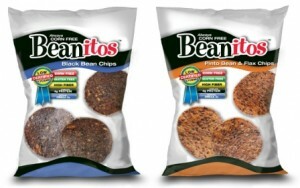 Be on the lookout for our two new flavors coming soon (http://www.prnewswire.com/news-releases/beanitosr-the-first-corn-free-bean-chip-smashes-initial-sales-goals-97299494.html) and until then, kick the corn, and crunch your beans! Cheers! Mike (Beanitos).